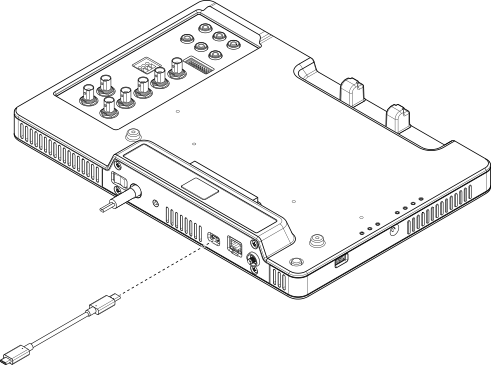 Complete the following steps to use a USB cable to connect the NI ELVIS III from the USB device port to your host computer. Connect the other end of the USB cable to the host computer. Ensure that the host computer is powered on before connecting the USB cable. If the connection is successful, you can see the IP address of the USB connection on the OLED display of the NI ELVIS III. Press and hold the user programmable button on the left-hand side of the NI ELVIS III workstation until you turn on the display. The IP address of the USB connection appears after the icon. Go to Setting Up the Host Computer next. Go to Configuring the Device next.